Political predictions are a risky affair. Who would have thought the BJP would be wiped out in Delhi and then again face a humiliating defeat in Bihar after their impressive Lok Sabha victory in 2014? We will continue to see this see-saw political battle. There are elections in several other states – Assam, West Bengal, and Kerala – in the days to come. We can’t possibly write off any political party, least of all a major national party like the BJP, which looks to be the only credible alternative to the rudderless Congress. There have been numerous discussions and analyses of what could have possibly caused BJP’s defeat in the cauldron of Bihar politics, dominated mostly by caste and, to a lesser extent, by religion. Here I want to make three simple points: one, at the level of BJP’s election maneuvering; two, at the level of political analysis in India; finally, the larger implication of BJP’s defeat for the tolerance/intolerance debate. It’s by now a matter of common sense that despite BJP’s claim of running an election campaign on the plank of ‘development’ in Bihar, they flirted with their core ideology of ‘Hindutva’. It came in the form of insinuating that 5% reservation would be taken away from lower caste Hindus and given away to Muslims if Nitish-Lalu Grand Alliance came to power. Such dog-whistling was followed by a more blatant claim that firecrackers would be burst in Pakistan if the BJP lost the elections in Bihar. No sensible voter attending the rallies would have had any doubt that ‘Pakistan’ is a generic marker for ‘Indian Muslims’, whenever their loyalty is in question, especially in critical moments of election. The reference to ‘Miyan Musharraf’ during past Gujarat election campaign had already set the precedence in this blatant communal polarization. The communalism of BJP’s Bihar campaign became more overt during the last phases, when its print advertisements were pulled off by the Election Commission. Still, they managed to get one through during the last phase: a woman holding a cow, an ad that takes a jibe at all those who insult a cow. While BJP’s primary defense in making ‘beef’ and, by implication, Muslims part of the main electoral issues is that it was Lalu, who first said that Hindus, too, ate beef. Such a defense, first of all, willfully forgets that BJP’s constituent elements had already lynched Mohammad Akhlaq in Dadri. Lalu’s comments didn’t descend out of thin air. Second, since many Hindus do consume beef, it’s still not clear how Lalu’s comments could ever become insulting to Hindus. It’s evident that after the first phase of polls, the BJP was desperate and wanted to hold on to the tail of an elusive cow to see them through the election. However, more than dog-whistling about the Muslim ‘other’ in its campaigns, what’s more worrying is how the BJP belittles such blatant communal polarization as “the heat and dust” of election campaign. It shows BJP’s callous attitude to the electoral process and the irreparable damage such tactics can inflict on India’s social fabric. Let’s not forget that such a strategy, while paying huge dividends in Uttar Pradesh during the Lok Sabha elections, has left a gaping wound in the society. 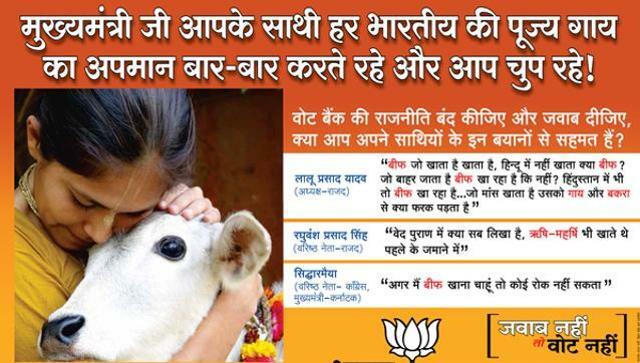 Dadri is a proof that such communal conflagration is more than “the heat and dust” of electioneering. It’s amazing to see how many of our political analysts are willing to buy into the BJP’s argument that communal posturing is, indeed, the result of “the heat and dust” of the electoral process. Of course, our political pundits don’t say so explicitly but their conclusions justify the desperate means of political parties. This time our political analysts’ attitude to tacitly build a ‘winner takes it all’ narrative turned out quite comical during counting. I was watching NDTV (for two reasons: first, I grew up watching this channel because there were not many options those days; second, that’s the only channel whose free online streaming works best). As the initial trends showed a tilt toward the BJP, the channel was already claiming a victory for the NDA alliance by 9 AM. As the initial trends were interpreted as a clear mandate for the BJP, the political analysts tried to explain why the BJP had done so well in Bihar. It was assumed that the people of Bihar had rejected caste-based politics and had become an aspirational class (more in line with Modi’s Lok Sabha victory). In effect, people, especially youngsters, saw hope in the Modi-led NDA. It was also proffered that once the youth had electricity and cell phones, they wanted more of the modern amenities. In a sense, economic mobility has an ability to trump caste divisions and produce a desire for social mobility. (This is an altogether different debate that economic mobility and caste mobility never seem to converge.) 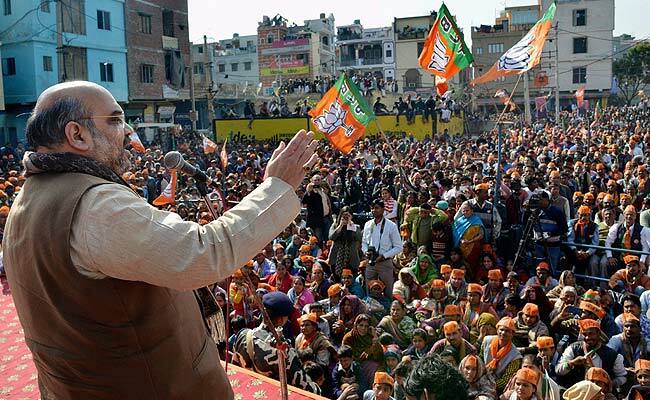 While there were minor protestations about BJP’s communal agenda, by and large the commentators seemed to be enamored of BJP’s development agenda and how the youth have rightly chosen a party which could deliver on it. By 11 AM, it became clear that this particular channel had bungled its telecast of counting. As it gradually emerged that the Grand Alliance would be forming the next government in Bihar, the commentators changed tack and BJP’s communal rhetoric seemed to feature prominently in the debate. What such political analysis shows is how little BJP’s blatant communal agenda matters to either the party or to the analysts, who are willing to take a ‘winner takes it all’ position. As if the means justifies the end. If BJP had finally won, I’m sure BJP dog-whistling during the election campaign in Bihar would have formed a minor blemish in a spectacular victory. The grave damage to our social fabric would have been acceptable for the sake of development. In case the BJP had won the Bihar election, there would have been another fall-out. People like Anupam Kher would have stood vindicated that the BJP stands for development and prosperity and not intolerance (communal or otherwise), as has been claimed. They would have further pointed out that the protesting writers, artists, intellectuals, filmmakers and scientists are making a mountain out of a molehill. This is what happens in a political culture that justifies the means for the ends. If the end is modernity’s robust march to lasting economic prosperity (albeit, only for a few cronies) and development, a few lives lost through lynching or shooting would just appear as a collateral damage. After all, if we can’t see the bigger picture, we are unpatriotic people (worse, deshdrohis). Here is a little reality check from the past. In 2007, when the Nandigram shooting took place in the Medinipur district of West Bengal, no one in their senses would have imagined what it would lead to in the next few years. The ruling CPI (M) brushed off the unfortunate killing of poor farmers, who were unwilling to part with their land for industrialization, as a minor incident. The writers, intellectuals and other creative people took to the streets to protest against the shooting. Until then, CPI (M) had never known what anti-incumbency was. Those of us, who had never seen any other government since our birth, could never imagine that the party could ever lose its grip in Bengal. It terrorized people in rural Bengal and mico-managed things to the extent that they even knew what was cooked in people’s houses. Once the protests on the streets grew, the Communist Party tried to discredit the people who had been relentlessly challenging the government’s inhumane land acquisition policy. The government organized counter-protests by their loyal artists and intellectuals (just the way BJP is doing) and termed the protesting intellectuals anti-development. What’s the final result? Mamata Banerjee emerged as a pre-eminent leader, piggybacking on the discontent, and unseated the Left from government. Something that was unthinkable even a few years ago. My intention is not to equate these two different moments in our contemporary history: 2007 in West Bengal and 2015 in India. The larger point I’m trying to make here is the prevailing political culture. A massive mandate – for the CPIM in Bengal and for the BJP in Lok Sabha – is no guarantee that the governments aren’t capable of becoming intolerant or adopting hideous means to perpetuate power. Rather, the obverse is true. Arrogance and hubris are often results of massive mandates. So the question is: Should the means justify the end in a political culture? Going by the result of Bihar elections and if we have any respect for constitutional processes, the answer must be: NO.